Members of an ER staff offer an excellent example of when the #NOW mindset is of greatest assistance to making decisions, often with a life-or-death implications. Highy-developed skills in combination with extensive prior — and relevant — experience must guide and inform those decisions. The inverse of Twain’s admonition also makes sense when rephrased “Why put off until tomorrow what needs to be done today, now.” In these situations, multi-taskers thrive. Presumably McKeown agrees with me that sequential tasking is preferential because it requires prioritization as well as an understanding of causality. Being proactive requires being selective. 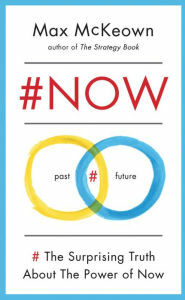 As I re-read this book and the highlighted passages before composing this brief commentary, I realized again that the #NOW mindset includes some lean principles that involve the elimination of waste in terms of hours, dollars, energy, productivity, efficiency, opportunities, and expectations. Long ago, Stephen Covey observed that most executives spend too much time on what is urgent and not enough time on what is important. Nowists do not make that mistake. They “set up a sustainable spiral of success by neatly side-stepping unhelpful emotional distress” and other incompatible distractions. For many who read #NOW, it may well be the most important book they ever read.